In 2018 the research and recording group spent the first few months finishing the work for our publication ‘Humphry Repton in Buckinghamshire & Beyond’ (see section on Humphry Repton commemorating 200 years). Work therefore on our main sites slowed to a crawl and it was not until the end of the year that we manged to post a new batch of dossiers on the website – these are Bekonscot, Dancers End Pumping Station, Newlands Tree Cathedral, Chilton House, Cowper & Newton Museum, Horwood House, Willen Lakes and East Burnham Park. A varied selection and all worth a read. With the passage of time we have inevitably lost a few of our original volunteers and so this year we aim to get a few new ones on board to help boost the project. We already have some keen recruits, but if you are interested please do not hesitate to contact Claire de Carle. A training session is being organised for Thursday 28 March 2019 at St Katherine’s Parmoor, near Frieth, between 10.30am and 3pm. Later in the year we will also hold a training session at The Centre for Bucks Studies and a tree training session. The Artists’ Gardens Project is running alongside the main project (see below). The sites currently in progress are as follows: Nether Winchenden, Weston Underwood, Hamden House, Little Horwood Manor, Dorney Court and Dorton/Ashfold School (including the Spa). Clare Butler, Geoff Huntingford, Sarah Tricks, Wallace Wormley, Ken Edwards, Gill Grocott, Jill Stansfield, Gwen Miles, June Timms, Mary Buckle and Sheila Meekums. Julie Wise (BCC HER officer) continues to give us valuable support. Jo Mirzeoff is also working on Artists’ Gardens and Mick Thompson was most helpful during the Repton project. This project was inspired by research previously undertaken by one of our volunteers into the gardens of Clare Leighton, the wood engraver, and John Nash, the famous WWI artist, in Bucks. Given the proximity of Bucks to London, we realised that a number of gardens survive that are connected with other local artists, particularly from the early to mid-C20. Over 20 artists are associated with gardens in the historic county. The most well-known artists we have range from Rex Whistler in the north of the county at Whitchurch, to John Piper just inside the border at Fawley Bottom. There are several artists’ colonies including at Hillesden, Piggots End (Eric Gill) and Hawridge Windmill (Gilbert Cannan). Paul and John Nash both feature strongly as they grew up in Iver Heath, carried out their war commissions at Chalfont St Peter (see Claire de Carle’s publication on Maud Grieve,available from Claire@decarle.plus.com) and then later John lived at Meadle near Princes Risborough. The abstract artist Ben Nicholson was born at Eight Bells, Denham where his father William and mother, artist Mabel Pryde, had a cottage. William Nicholson was also a successful artist; he was undoubtedly inspired by his garden as he painted still lives of flowers. The well-known botanical artist and explorer Margaret Mee grew up in Chesham. The American poster artist Edward McKnight Kauffer lived with his partner Marion Dorn, the textile artist, in the South Bucks village of Turville; they both worked on commissions for London Underground which were inspired by the countryside. Many were polymaths, lending their hand to different applied arts, including ceramics, textiles and book illustration. Was the garden cultivated; how? What was grown and how was it characteristic of that artist? Did the artist take inspiration from the garden and the surrounding countryside? If so, to what extent was the garden, plants and the setting influential on the artist? Was the artist a gardener and influenced the garden, and if so what did they do and how much of this survives? Does anything remain? If so, what? The findings will be written up as about 20 short site dossiers. These will provide the material that can be summarised and analysed in the form of a book. This will include an introduction to the area and the period, and what was happening at the time in the art world as context for each. A gazetteer entry for each will reflect the answers to the questions above. Illustrations of the artist’s work and volunteers’ photographs of the gardens will be included as far possible. The book will conclude with the legacy of these artists. Are there still artists who are inspired by their gardens living in Bucks? The success of the annual Bucks Art Week suggests that there are. This is a unique project, looking at the relationship of artists with their gardens in a particular county, both horticulturally and artistically and the survival of associated gardens and their planting. You can see all the sites we have made records for here. You can obtain a full printed copy of Records for £18.50 on application to BAS. You can of course read the full site ‘dossiers’ by clicking the links on our Locally Important Sites page. We have added new sites throughout the year, and have just added Addington Manor, Great Brickhill Manor and High & Over, Amersham. High and Over proved a difficult choice as it is so damaged by the mid- to late-twentieth century housing which in part covers the original site. However its importance as perhaps the first significant house and gardens in the modernist style in the country meant we had to include it. We very much enjoyed our warm welcome from the owner and had a very good site visit. Chetwode Manor, a modern garden originally created for Mrs Ruby Fleischmann, a former Chairman of the National Gardens Scheme, surrounding a sixteenth century, and later, manor house and associated buildings, in an elevated position facing south, and with impressive views. 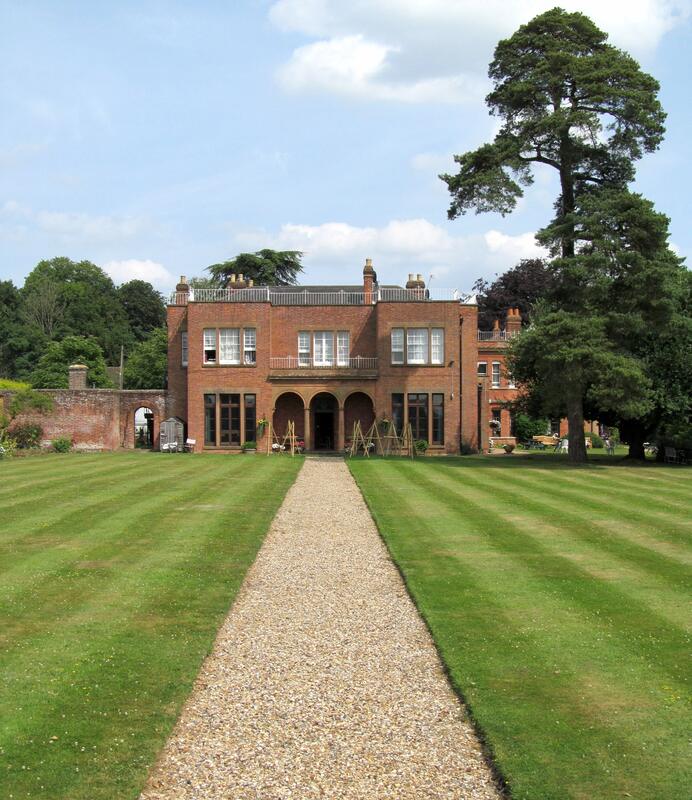 Nearby Chetwode Priory, with gardens and a small late‐20th century park for a mid‐19th century country house on the site of a previous house. Most of the present garden layout was developed during the mid‐19th century from 1833, incorporating some earlier features, but garden creation continues. Wendover Manor, now a school, it features the remains of a typical garden, pleasure ground and small park for a Chiltern manor house rebuilt in the 1870s to a design by George Devey with associated gardens. The key surviving ornamental period is the late C19, including mature trees, a walled kitchen garden and modest parkland. and our research sites to the end of 2015. Records of Bucks is produced annually by the Bucks Archaeological Society. It is now two years since we launched the HLF funded Buckinghamshire Gardens Trust Research and Recording project and we now have a group of twenty trained volunteers who are currently working on sixteen sites across the historic county. Virginia Hinze was recruited to train the volunteers at a number of sessions during 2013/14, these were held at Green Park/Aston Clinton and St Katherines, Parmoor (right). During the training our team learnt how to observe and interpret a site, and a method for writing up their research to a standard format. This was then backed up by visits to Hughenden Manor and Aylesbury Cemetery lead by Dr Sarah Rutherford (formerly of English Heritage) who has been a dedicated mentor to the team throughout the project. An important part of our research is to be able to identify different sorts of trees, and we have therefore held Tree Identification Walks at Christ College (right), Oxford, and Hartwell House. 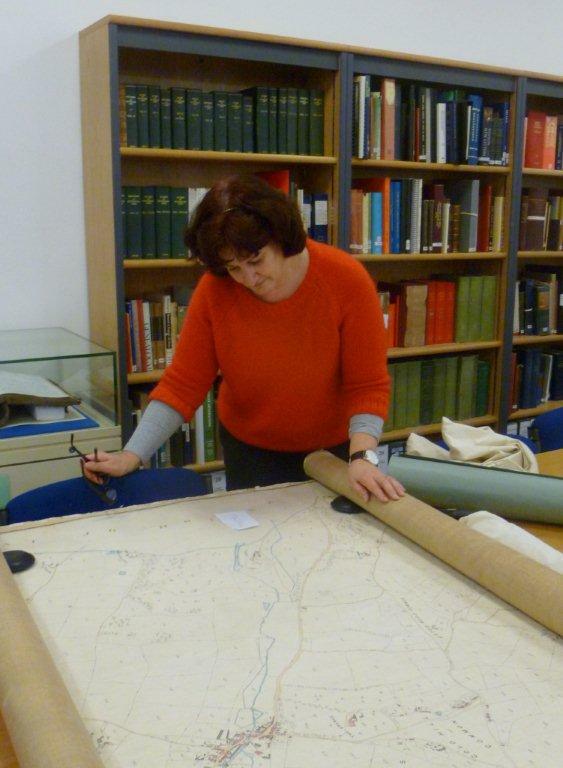 The availability of OS maps is another important tool for the researchers and for this we were fortunate to have considerable assistance from Julia Wise at the Bucks County Council Historic Environment Records. 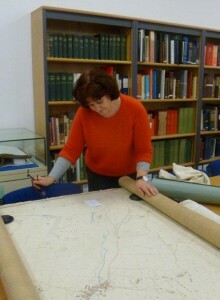 Our volunteers also need other interpretative skills to carry out their own research before visiting a site, and to help with this familiarisation sessions were held at the Centre for Buckinghamshire Studies in the Local Studies and Archive Rooms (here is Claire de Carle at work in the CBS). Once the training was complete, our volunteers working in pairs with guidance from Sarah Rutherford chose a site they would like to research. We have over 350 to choose from, many of them are already listed on Parks & Gardens UK, so as you can see we will be busy for quite some time. They set about obtaining all the necessary information and maps, including drawing a boundary map, which was then sent to the owners of the property along with a letter politely requesting permission to visit the garden and record what remained of historic interest. Having completed these tasks the lengthy process of writing up commenced. The first sites were always going to be the most challenging and our grateful thanks go to all who have stuck at it, and have now recorded more than sixteen sites. It has not only been about hard work we have had a lot of fun and enjoyed some lovely teas (Parmoor), and lunches, including a welcome bowl of hot soup at Charles Boot’s home, Park Lodge, on a very wet day at Hartwell. Many thanks go to Rosemary Jury for organising all of the outings. As the pilot project with lottery funding comes to an end, we are now seeking funding, by applying to various horticultural trusts, to keep the project running for the next two to three years as we have only just touched the surface of the wealth of un-registered gardens in Buckinghamshire. 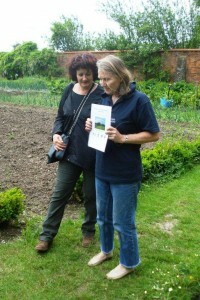 Claire de Carle presenting the completed report to Lady Parmoor in the walled Garden at St Katharine’s. There are over 500 gardens of historic interest in Buckinghamshire and most are listed on the Heritage Environment Record, however there is very little detail available to the wider public about these sites. This prompted the Buckinghamshire Gardens Trust to launch a project to enable us all to better understand historic gardens. Dr Sarah Rutherford (Vice Chairman of BGT) was instrumental in getting the project off the ground with support from Verena McCaig, Linden Groves and Virginia Hinze, who was recruited to carry out the training of volunteers. We were also spurred on by a rousing speech that Brian Dix made at our annual Christmas lunch in 2012 during which he stressed the importance of garden recording. I was asked to co-ordinate the project, and we started by recruiting volunteers from our existing membership and invited them to an initial meeting at the end of February 2013 at Hartwell House Spa. The volunteers were very enthusiastic and brought a wide range of skills and experience to the group, we built the group up over the next few months and we now have a team of seventeen dedicated researchers/recorders. Sarah and I spent most of the summer of 2013 planning how we were going to execute the project and also how we might finance it. We could not expect the Trust’s funds to cover all the expenses and local authorities were not forthcoming. It was therefore decided that we would apply for a ‘Sharing Heritage’ HLF grant. I could have not managed this on my own and was grateful for all the assistance from the BGT volunteer team; we finally submitted the bid at the beginning of October. Just before Christmas 2013 we heard that we had been successful and had been awarded just under £9,000 to add to the £1,000 provided by the BGT. So 2014 is proving a very busy year for the BGT as we start the pilot project with 15 gardens in the Wycombe District of the county. 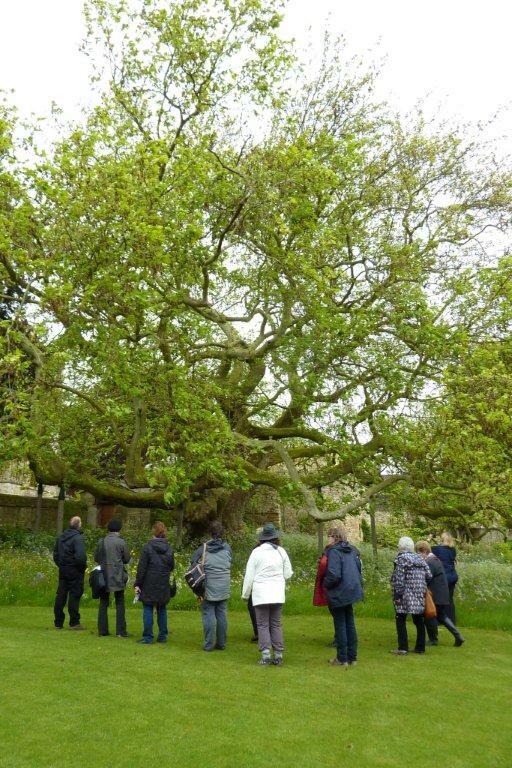 We have already held a number of training sessions, two at the Centre for Buckinghamshire Studies, these familiarised the group with the research material that they would need for each garden before visiting the sites. In the autumn Virginia lead two training sessions at Green Park (formerly Aston Clinton House). Buckinghamshire County Council has owned the site at Green Park since the early 1960’s; the house had been demolished prior to this in 1958. It use it as a conference/training centre and has constructed a number of accommodation blocks and sports facilities, including a gymnasium on the footprint of the house. The site was a good choice for training as it is fairly extensive (around 26 acres) and has an interesting history and substantial archive as well as significant evidence on site. The park dates from the mid eighteenth century when Gerard Lake, 1st Viscount Lake (1444–1808) was Lord of the Manor, he carried out considerable planting and building work. The property came up for sale in 1849 and was purchased by the banking family, the Rothschilds; they already owned several estates in the area, including Mentmore, Halton and Waddesdon. Sir Anthony Rothschild and his family used Aston Clinton as their country residence. Sir Anthony set about major alterations to the house and grounds, transforming it into an elegant mansion set within delightful pleasure grounds, as would be expected of the home of a family of their stature. During the training we un-covered considerable evidence of the formal gardens: a balustrade with urns that encircled the front garden and would have formed a turning circle for the drive, a quartered parterre with Portland stone steps, a bridge with balustrades underneath which was a fairy glen, formed from a natural spring and planted with ferns, a wellhead/fountain, clumps of specimen trees and several entrances and driveways. These all caused excitement and much discussion amongst the group when we returned to the classroom to learn how to write up our findings based on the format of the Historic England Register of Parks and Gardens. We held a third training day at a very different venue St Katharine’s, Parmoor near Frieth (owned by the Sue Ryder Foundation). Reports have now been written for both sites, with boundary maps to show the area of historic interest, and statements of significance for both sites. It is very encouraging to hear that the dossiers produced for both sites have already been used by the Council planning archaeologist to inform applications made at both sites. The pilot scheme is now being extended to include other vulnerable sites in Bucks.